This series lens are for full size DSLR cameras. From a wide-angle zoom lens to a telephoto zoom lens are lined up by maximum aperture F2.8 and F4. There is 100mm macro lens also. This new Tokina lens is the first in a new generation of full frame (FX) lenses designed for professional digital SLR cameras like the Canon EOS 5D Mark II and the Nikon D700 and D3x. The 16-28mm zoom range gives the professional photographer a super-wide angle of view to get close to subject for dramatic effect or to take in entire scenes. The Tokina AT-X 16-28mm f/2.8 PRO FX uses a newly developed silent DC motor that allows the lens to focus faster and more quietly then previous generations. The DC motor coupled with a new GMR magnetic AF sensor work together to increase AF Speed. A new, 56mm in diameter, large sizes aspherical glass element is incorporated into the front lens group, while there are 2 more aspherical elements in the rear group. 3 SD super-low dispersion glass elements are also incorporated through-out the optical design to reduce chromatic aberration, give maximum resolution, more even brightness and distortion correction. Designed for Full Frame cameras, the Tokina AT-X 17-35 F4 PRO FX give photographers a new wide-angle option. With a focal length of 17mm at the wide side the lens yields a spectacular 103.9 degree field of view which is great for shooting in tight situations or for taking in wide expanses of space. This compact wide-angle zoom has a bright constant f/4 aperture make viewing and auto focus possible in lower light situations but still maintaining a reasonable size and weight. Two Super-Low Dispersion glass elements and one aspheric glass allow the proprietary optical design to achieve excellent contrast and sharpness as well as controlling chromatic aberration. Tokina’s exclusive One-touch Focus Clutch Mechanism allows the photographer to switch between AF and MF simply by snapping the focus ring forward for AF and back toward the lens mount for manual focusing. Additionally the mechanics have been designed for better seals around moving parts making the lens more water-resistant than lenses of the past. The lens is also designed to stand up to the rigors of daily use by photographers in a wide variety of shooting conditions and environments. The Tokina AT-X 24-70mm f/2.8 PRO FX lens gives photographers with full frame Canon and Nikon camera bodies a 24mm wide-angle to 70mm moderate telephoto lens with a fast f/2.8 aperture at an affordable price. The new groundbreaking proprietary optical design uses three precision molded all-glass aspherical lens elements to achieve excellent contrast, sharpness, and corrects for spherical aberrations. One of these elements is very special and difficult to manufacture. G09, is made from Super-Low Dispersion (SD) glass and is a large sized aspherical element. These lens elements also yield even illumination across the whole image sensor. The Tokina 24-70mm lens also uses three SD (super-low Dispersion, “FK01” and FK03”) glass elements in the rear groups to control chromatic aberrations. All these specialized lens elements work in consort to yield maximum resolution to match the 50-megapixel DSLR cameras entering the market. The fast constant f/2.8 aperture makes viewing and auto focusing possible in very low light situations while keeping some flexibility for setting the shutter speed. In addition to excellent optics, the lens incorporates a fast moving SDM (Silent Drive-Module) motor to greatly reduce AF noise making it one of Tokina’s quickest and quietest auto-focusing lenses to date. The new Tokina AT-X 70-200mm f/4 PRO FX VCM-S is featuring a new Vibration Correction Module and ring-shaped ultrasonic style auto-focus motor. This lens is designed for digital cameras with full sized sensors as well as APS-C (DX) sensors. The Tokina AT-X 70-200mm lens is the first lens with Tokina’s new proprietary VCM (Vibration Correction Module). This technology allows for up to 3 stops of vibration correction* to reduce the affect of camera shake in situations were a tripod or monopod cannot be used. Additionally the new 70-200 Lens features a complete ring-shaped ultrasonic motor for faster and quieter auto-focus. This new motor allows for the minute adjustments between AF and manual focus modes dramatically increasing operability. The “S” denotes the new ultrasonic motor. The optical design of this lens has 3 SD (FK01) Super-low Dispersion glass elements to correct for chromatic aberration and maintain heightened optical quality throughout the zoom range. Tokina’s announcement of the AT-X 70-200 lens expands the lens lineup to include a compact high-performance telephoto zoom lens that has great portability in a professional caliber telephoto lens. 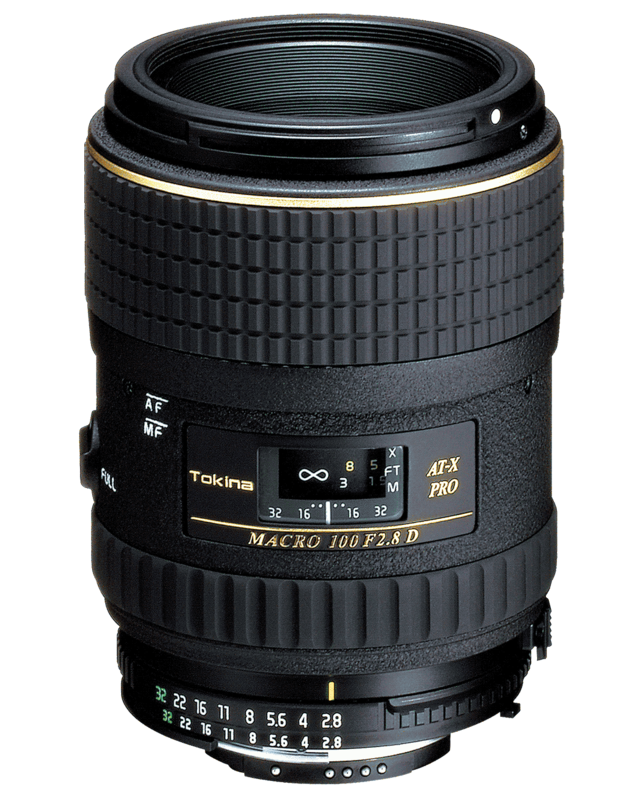 The Tokina AT-X M100 AF PRO D is a new macro lens capable of life-sized (1:1) reproduction at 30 cm. The lens’ multi-coating have been re-engineered to match the highly reflective silicon based CCD and CMOS sensors in today’s digital SLR cameras. This lens gives the best of both worlds because optics still give full coverage and excellent sharpness on 35mm film. A macro lens that can handle both the digital and film worlds with ease. The AT-X M100 AF PRO D also has a very convenient focus limiter switch that can lock the focus out of the closes focus making it focus faster when used as a moderate telephoto lens that is excellent portraits as well. Deep bayonet mounted lens hood. Note: Autofocus with this lens is not supported with Nikon DSLRs that do not have a focus motor in the camera body. 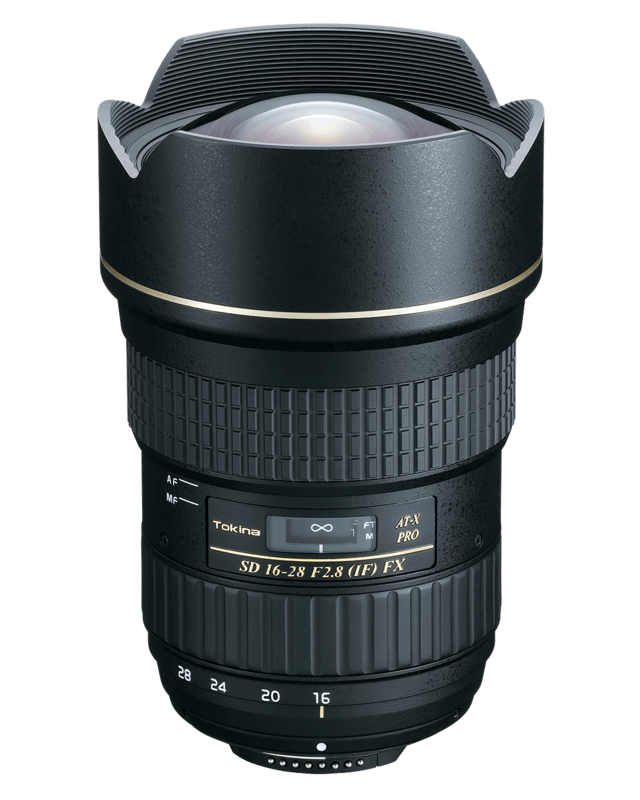 Tokina AT-X M100 AF PRO D for Nikon mount conforms to the specifications of «Ai AF-D» Nikon lenses. When using with a Nikon DSLR camera or a film camera with CPU system, it is necessary to set the aperture ring to the minimum aperture value (f/32). To prevent accidental movements of the aperture ring from the minimum aperture value the ring can be locked in place with the small slide switch adjacent to the ring (to release the lock, slide the lever to the opposite side). When setting the aperture value to f/32 and then changing it by the dial on the camera, the aperture value displayed in the viewfinder will be other than f/32. At this time, the diaphragm blades do not move but will operate according to the aperture value displayed when shuttering. Note: When set on other than the minimum aperture value (f/32), the «FEE» error message flashes and the shutter cannot be released.